When your clients say they want a tropical oasis, what are they envisioning? Maybe they see a tranquil water feature, warm breeze and, of course, some lush and colorful foliage. You can bring this vision to life for your pool clients by installing a variety of plants. The right foliage can really transform the pool area. But with so many plant choices, where do you start? There are some varieties that are better suited for pools because of features like their colors and planting requirements. And there are others that will cause more problems for the pool area than they are worth. Here’s a look at what plants you should — and shouldn’t — install around a pool area. Pools and the surrounding landscape should create a relaxing, luxurious space where your customers can relax and entertain. You need to use the right plants in your design to achieve that tropical feel and wow your prospect. Different types of flowers and foliage can be used to create a variety of looks, whether that’s a tropical oasis, southwest-inspired pool or modern retreat. Show clients you understand their lifestyle and pool visions by choosing the right plants. Colorful, lush plants will really transform the pool area into an oasis. There are a variety of full-sun perennials that will provide color, such as windflowers and day lilies. Perennials won’t die after flowering, so the homeowner won’t have to worry about cleaning up after them. Beyond adding color, you can also use plants to create a sense of privacy around the pool. Plants like bamboo, palm trees and hedges can create a natural fence to enclose the space and even create some shade. You also want to use a mix of plants to add texture to the landscape around the pool. Combining ornamental grasses, cactuses, flowering plants and other foliage will really help the design pop. To add the most texture to the beds, create layers with different sizes and styles of plants. Install a variety of plant types, like combining grasses with leafy and flowering varieties. Place the taller plants in the back or middle of the bed, and tier the plants forward in height toward the edges of the bed. Stagger the plants — instead of putting them in rows — to create a more intriguing, textured appearance. You should use at least three of each plant, unless it’s a large focal point like a tree, and group them in odd numbers. Not every colorful, lush plant should be used around pools, however. You want the plants you choose to add visual interest to the space — not unwanted leaves and materials that can get in the pool. Leaves, pine needles and dead flowers can create extra work for clients if the materials land in the pool. Plus, they can clog filters. So, you should stay away from plants that drop leaves or seed heads. You also need to make sure the plants you choose match the site’s conditions. Most pools are installed in spaces with direct sun, so the plants you use in the design should be suited for the sunlight. The space around a pool is almost like a microclimate, and the plants you use need to be able to handle it. A good pool and landscape design not only looks good: It also incorporates practical, low-maintenance materials. So when you’re adding plants around a pool, make sure they are the perfect finishing touches to the oasis experience — and not something that will cause the client headaches later on. Stick to colorful foliage that can survive the climate and won’t drop leaves in the pool. 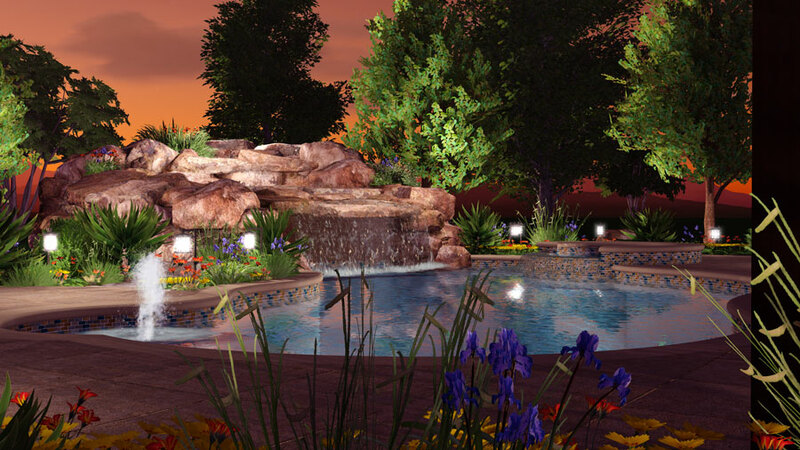 You can test out different plant combinations and locations using 3D pool and landscape design software like Vip3D. The software’s library has a wide range of plants to choose from, and you can also import your own plant photos into the design. 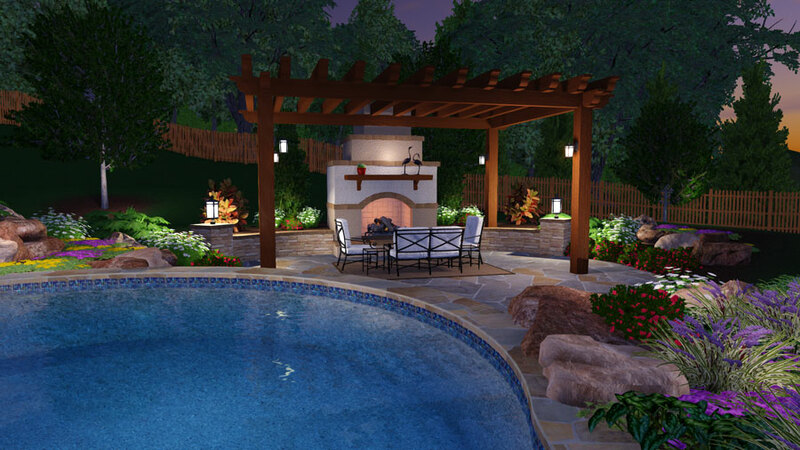 With the software, you can also incorporate other service add-ons like pool lighting and outdoor furniture to create the complete experience. 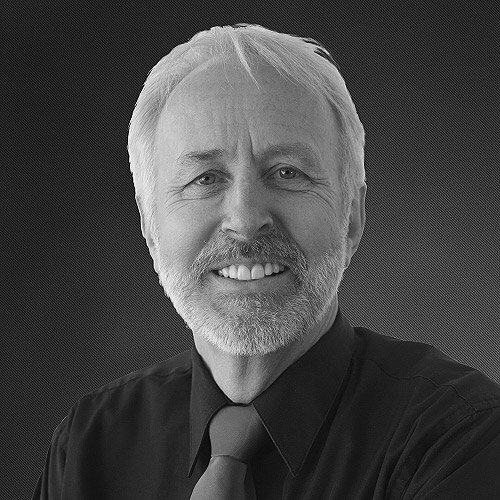 These are the details that will help your customers imagine themselves in the space and move them one step closer to a signed contract. 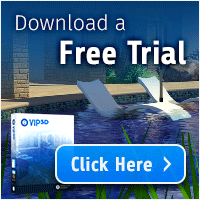 See how 3D pool and landscape design software can give you the tools you need to close more project with a free live demo.